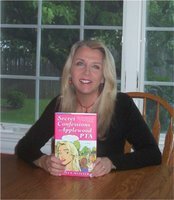 Previous contributor, guest editor, staff member, and continual good friend Ellen Meister’s debut novel, Secret Confessions of the Applewood PTA is in stores today! Patricia Parkinson interviews her about the book, and you can also read an earlier interview by SLQ here (and read her wonderful story while you’re at it). More about Ellen on her web site.